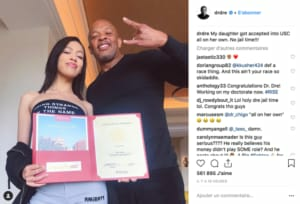 Hip-Hop rapper/producer Dr. Dre took to Instagram to praise his daughter, Truly Young, for getting into the University of Southern California all on her own. The comments by Dre, 54, came in the wake of the scandal involving Hollywood stars Felicity Huffman and Lori Loughlin, who allegedly paid a consultant to get their children into elite colleges. Dre’s post has since been deleted but they were captured by People. “My daughter got into USC all on her own. No jail time!! !” posted Dre. Truly also shared the photo on her own Instagram account and said that she’ll be attending the USC School of Cinematic Arts, according to People. A review of her Instagram account on Sunday did not show the post. What Dre did not share on the post is that he and music industry mogul Jimmy Iovine gifted $70 million to the school in 2013 to create the USC Jimmy Iovine and Andre Young Academy for Arts, Technology and the Business of Innovation. Despite the donation, there has not been any evidence to show that the donation was a consideration for her admission. It should also be noted that Dre’s donation was not a part of a scam and has been an asset to hundreds of students coming through his program. Dre and Iovine, founders of Beats Electronics, established the school for undergraduate students interested in marketing, business entrepreneurship, computer science, engineering, audio and visual design and the arts, People reported. Earlier in March, about 50 people were named in the scandal in which Huffman, Loughlin and others were charged in the alleged $25 million racketeering scheme, according to E Online. In the alleged schemes, fees were paid to stand-in test takers and coaches in exchange for helping young people get admitted into elite colleges. In some cases, the applicants were misrepresented as elite varsity athletes, according to E.
Celebrities expressed praise over Dre’s now-deleted post. Diddy posted a flexed arm emoji in response, according to People.